WASHINGTON — President Donald Trump said Tuesday that he is "100 percent" prepared to shut down the U.S. border with Mexico to block an influx of migrants. "If we don't make a deal with Congress, the border's going to be closed," he told reporters in the Oval Office. "100 percent." On Monday, Homeland Security Secretary Kristjen Nielsen directed Customs and Border Protection to send up to 750 additional officers to the border to assist with a policy designed to keep asylum-seekers in Mexico while they await adjudication of their cases. NBC first reported on that decision last week. The number could be increased to 2,000, according to the department. Earlier this year, Trump shut down parts of the federal government for five weeks over a demand that Congress provide $5.7 billion to fund new barriers along the border. After he re-opened the agencies, he and Congress agreed to a border package that included money for technology upgrades and about 55 miles of new fencing but prohibited the construction of a solid wall. Trump then announced he would unilaterally transfer previously appropriated money from the Pentagon's accounts for building military bases and other areas of the government to build more wall without congressional approval — a move that immediately drew lawsuits from state attorneys general who argue he acted outside his constitutional authority as president. 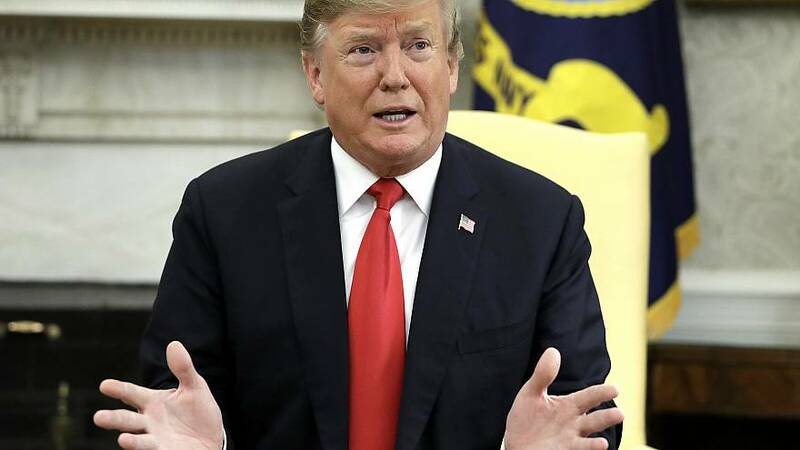 Trump said Tuesday that he now wants Democrats in Congress to accede to his long-held goals of rewriting the visa lottery system and rules that give favor to family members of people who already have immigrated to the United States. "Congress has to meet quickly and make a deal," he said. Though experts have warned that shutting the border could hurt the U.S. economy — goods worth more than $1.5 billion cross the border on a daily basis — Trump said that's a secondary concern for him. Trump also addressed his recent decision to cut off aid to three Central American countries — Guatemala, El Salvador and Honduras — from which many of the migrants have traveled to the U.S. border. Critics say that decision will likely create more, not fewer, refugees from those countries. Trump framed it as a natural response to what he views as the failure of the recipients of U.S. aid to give reciprocal value. "They don't do anything for us," he said, and have been "taking advantage of the United States" for many years. "They arrange these caravans, and they don't put their best people in those caravans ... We're not going to have it anymore."